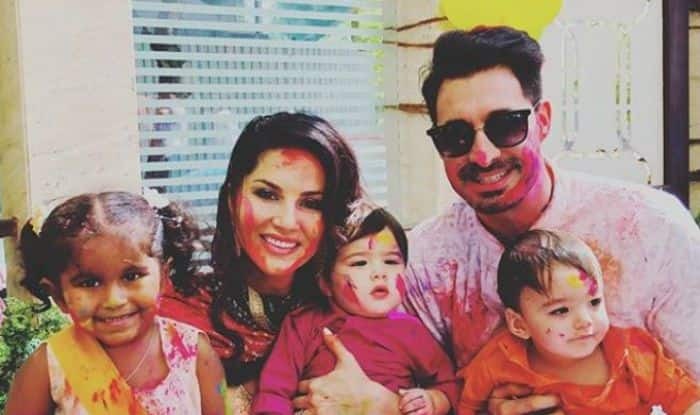 Sunny Leone, who has been grabbing everyone’s attention for her auto biopic “Karenjit Kaur – The Untold Story of Sunny Leone”, shares a special Holi picture of her family. In an adorable post, Sunny is posing with her three children, twins Asher-Noah Singh Weber, elder daughter Nisha Kaur Weber and her husband Daniel. she captioned the picture as, “Happy Holi from the Weber’s!!”. Sunny Leone has very successfully made her mark in Bollywood in a very short time. The actress today has millions of followers across the nation. Married to her longtime American boyfriend Daniel Weber, Sunny has kept her life between California and Mumbai. The couple manages to be with kids whenever possible. They celebrated the festival of colours with the family. In pictures, all of them are dabbed in colours and the kids look cute AF. Daniel too shared a boomerang video and a pic.